Allow us to share our stories with you. We have a lot to tell. 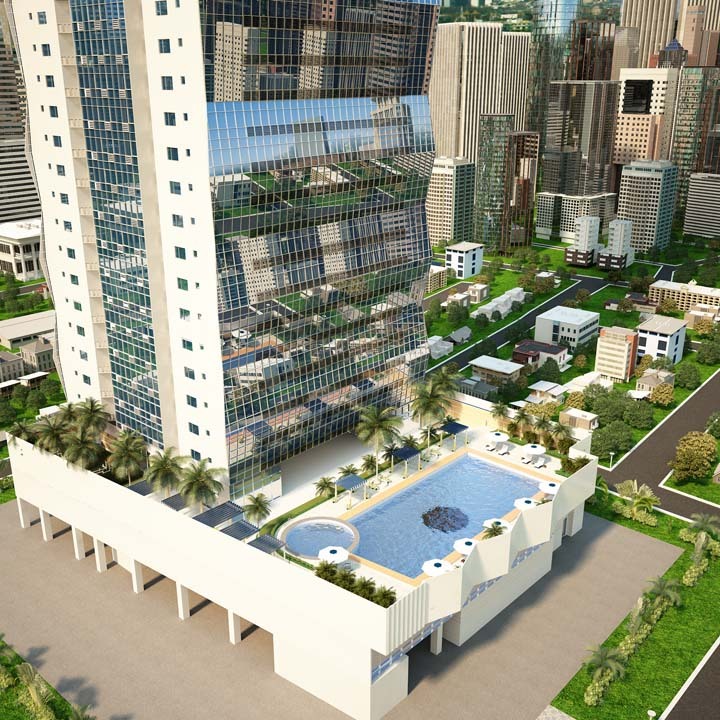 Find out more about us and our unique offerings to know which of our developments fits your lifestyle well. 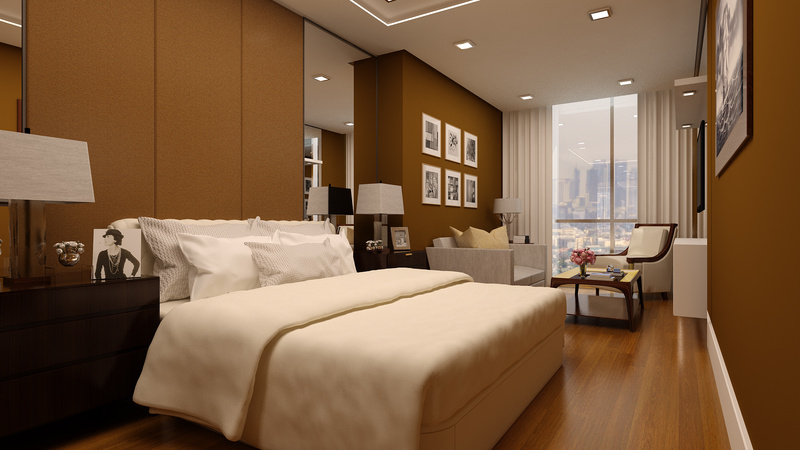 Moving into a new home in time for Christmas is a great idea. 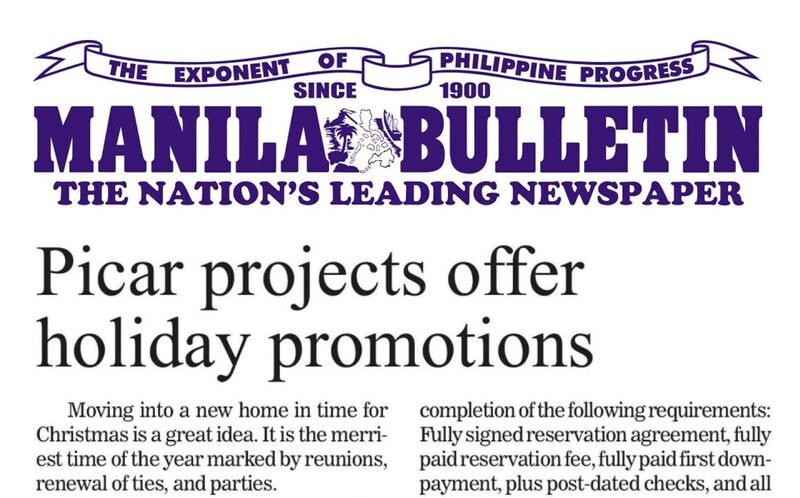 It is the merriest time of the year marked by reunions, renewal of ties, and parties. 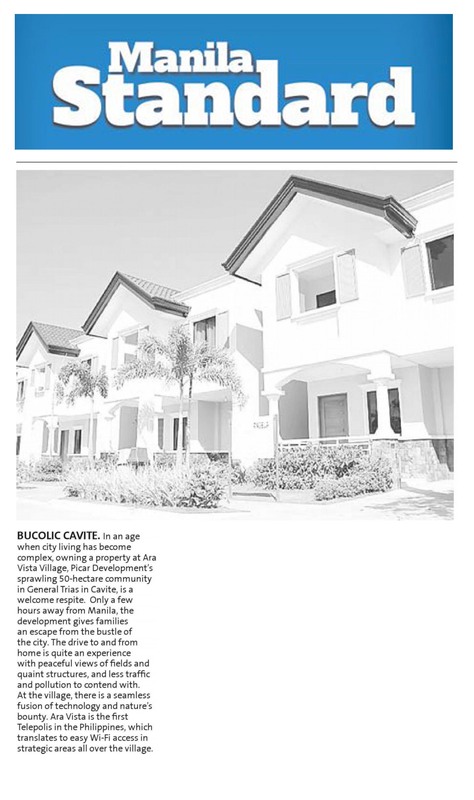 In an age when city living has become complex, owning a property at Ara Vista Village, Picar Development's sprawling 50-hectare community in General Trias in Cavite. 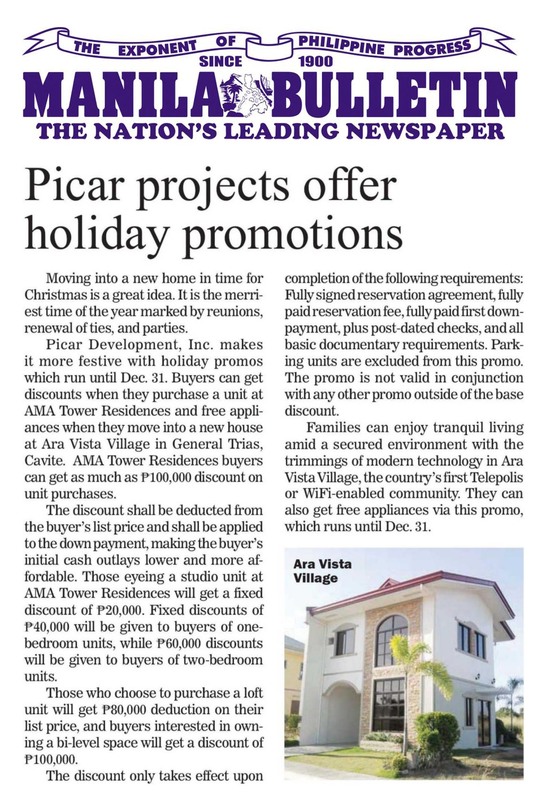 Picar Development Inc. wnats to make the holidays more festive for new homeowners at AMA Tower Residences in EDSA and Ara Vista Village in Gen. Trias, Cavite. 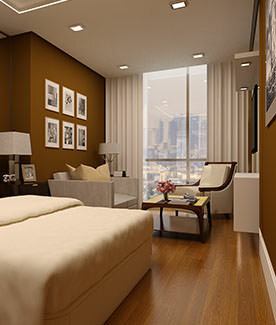 Nothing is more fulfilling than finding a home tailor-made for your needs. 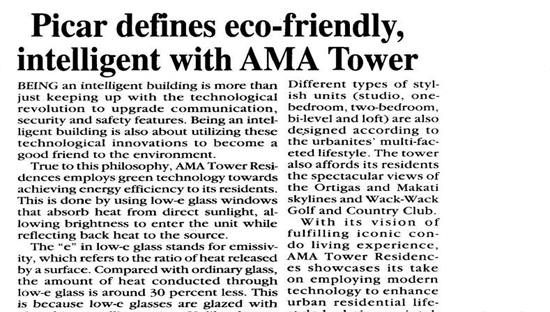 At AMA Tower Residences, a 34-storey condominium development along EDSA-Ortigas, there is a unit that complements every lifestyle and homeowner profile. 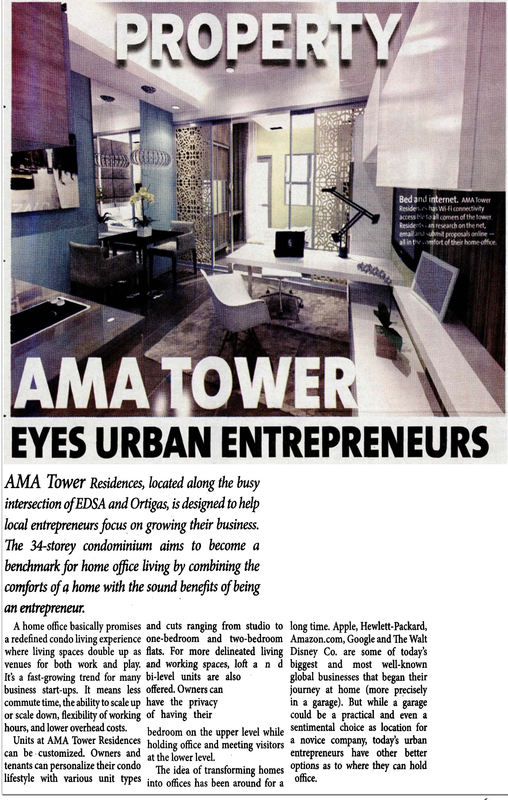 AMA Tower Residences, located along the busy intersection of EDSA and Ortigas, is designed to help local entrepreneurs focus on growing their business. 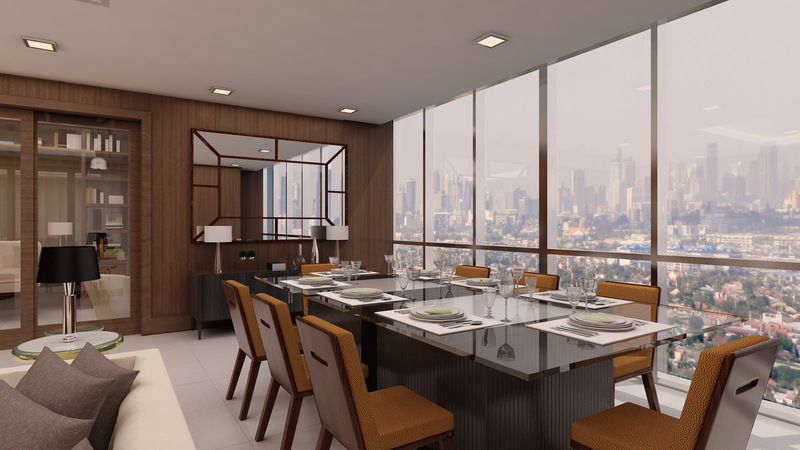 The 34-storey condominium aims to become a benchmark for home office living by combining the comforts of a home with the sound benefits of being an entrepreneur. Being an intelligent building is more than just keeping up with the technological revolution to upgrade communication, security and safety features. 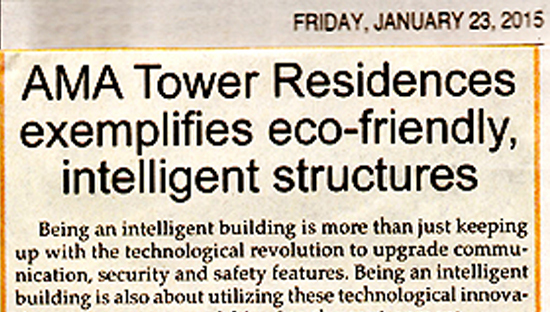 Being an intelligent building is also about utilizing these technological innovations to become a good friend to the environment. 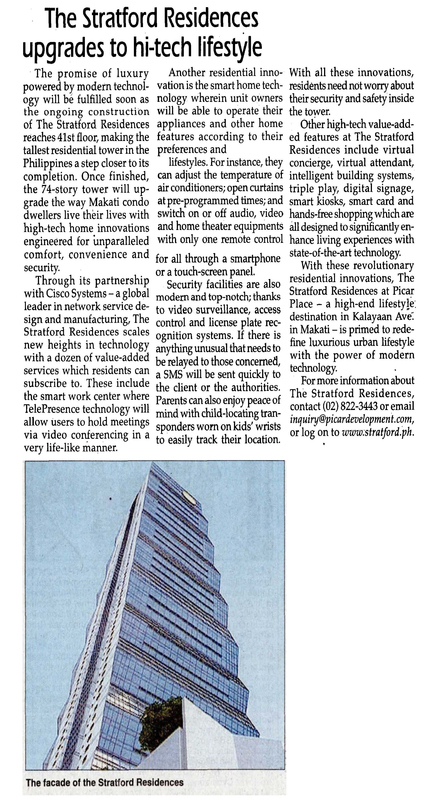 The promise of luxury powered by modern technology will be fulfilled soon as the ongoing construction of The Stratford Residences reaches 41st floor, making the tallest residential tower in the Philippines a step closer to its completion. 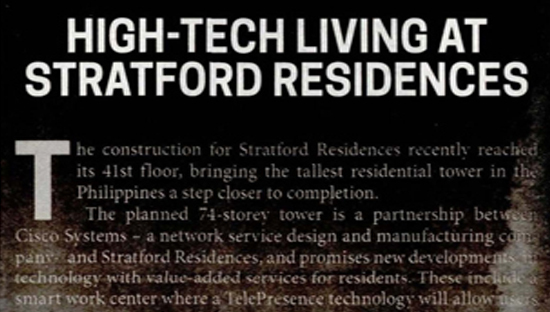 The construction for Stratford Residences recently reached its 41st floor, bringing the tallest residential tower in the Philippines a step closer to its completion. 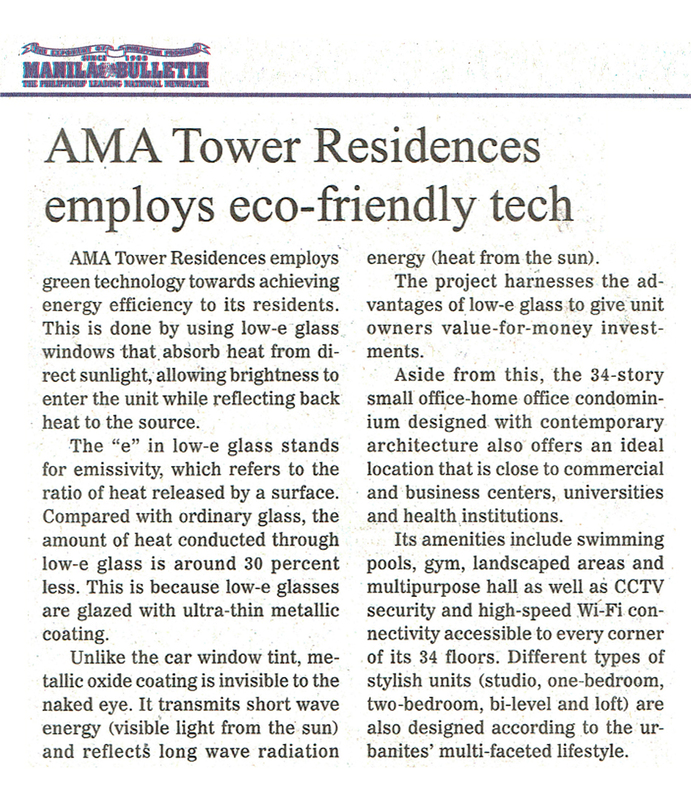 AMA Tower Residences employs green technology towards achieving energy efficiency to its residents. This is done by using low-e glass windows that absorb heat from direct sunlights, allowing brightness to enter the unit while reflecting back heat to the source. 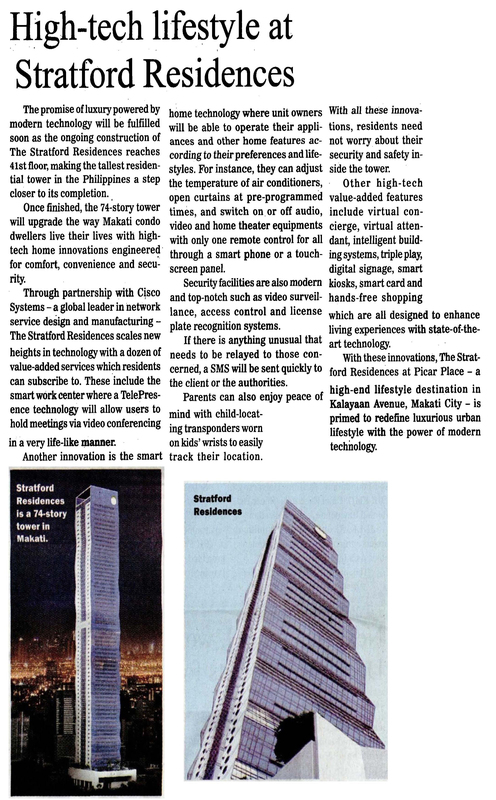 Being an intelligent building is more than just keeping up with the technological revolution to upgrade communication, security and safety features. 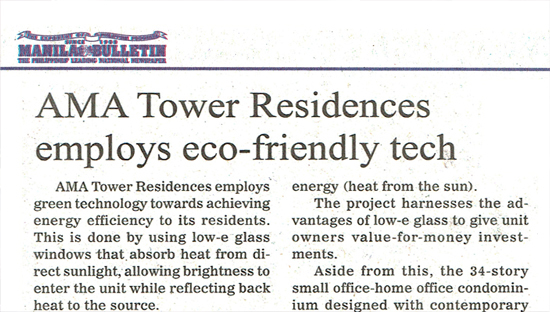 Being an intelligent building is also about utilizing these technological innovations to become a good friend to the environment. Modern parents want nothing less than the best for their children, especially when it comes to raising them well. 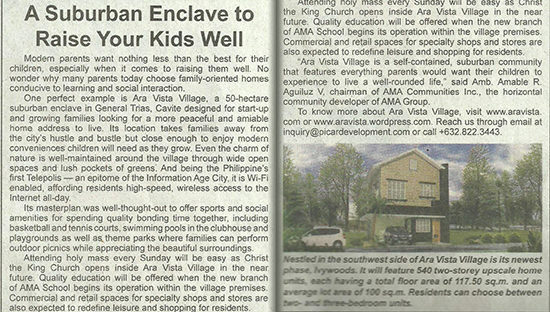 No wonder why many parents today choose family-oriented homes conducive to learning and social interaction. 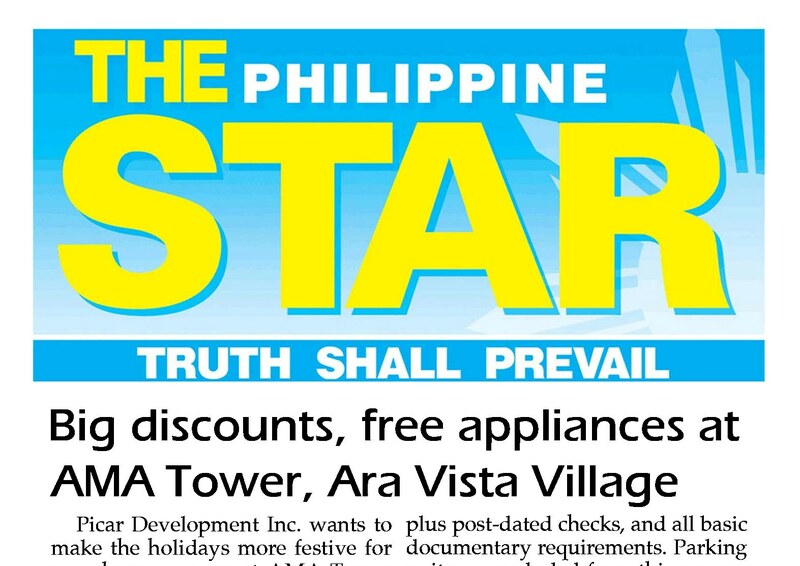 One perfect example is Ara Vista Village, a 50-hectare suburban enclave in General Trias, Cavite designed for start-up and growing families looking for a more peaceful and amiable home address to live. 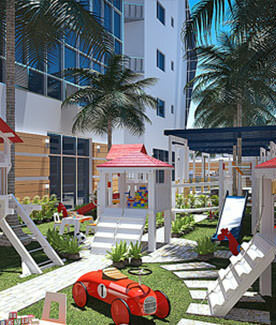 Its location takes families away from the city’s hustle and bustle but close enough to enjoy modern conveniences children will need as they grow. 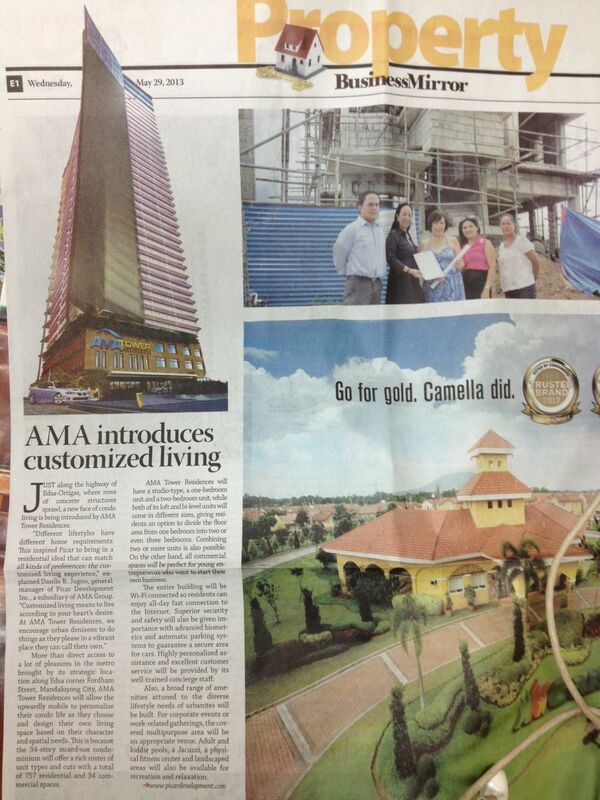 Just along the highway of EDSA-Ortigas where rows of concrete structures sprawl, a new face of condo living is being introduced by AMA Tower Residences. 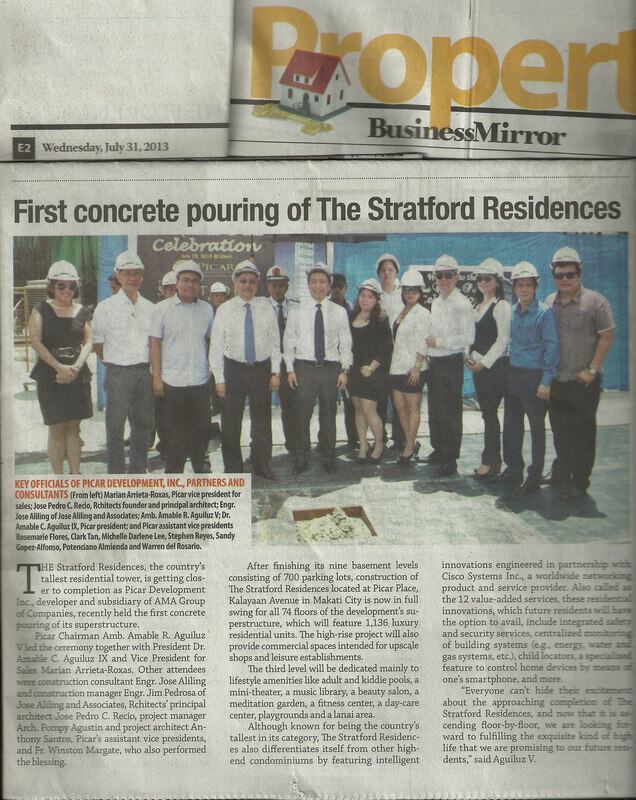 The Stratford Residences, the country’s tallest residential tower, is getting closer to completion as Picar Development, Inc., developer and subsidiary of AMA Group of Companies, recently held the first concrete pouring of its superstructure. Picar Chairman Amb. 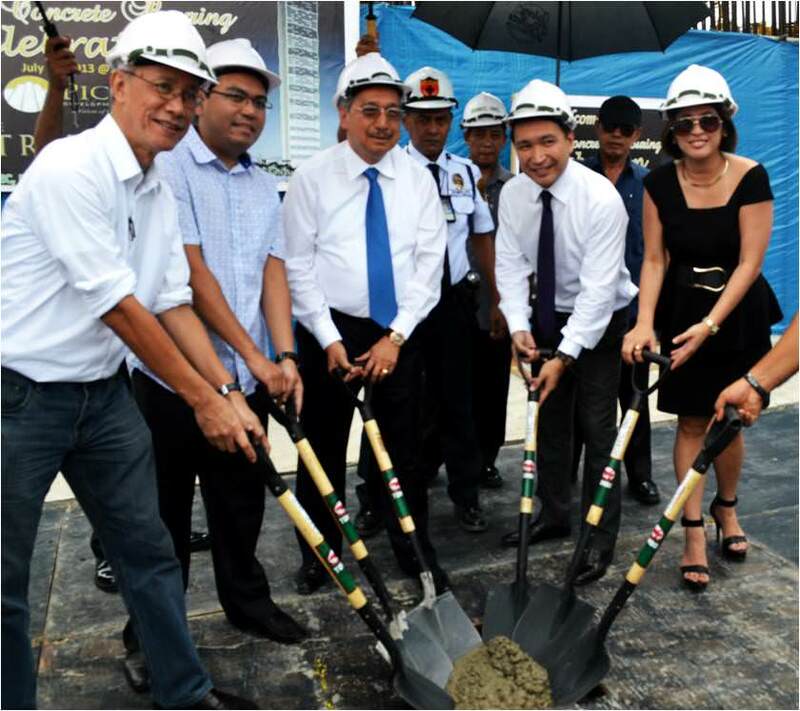 Amable R. Aguiluz V led the ceremony together with President Dr. Amable C. Aguiluz IX and Vice President for Sales Marian Arrieta-Roxas. Other attendees were construction consultant Engr. Jose Aliling and construction manager Engr. 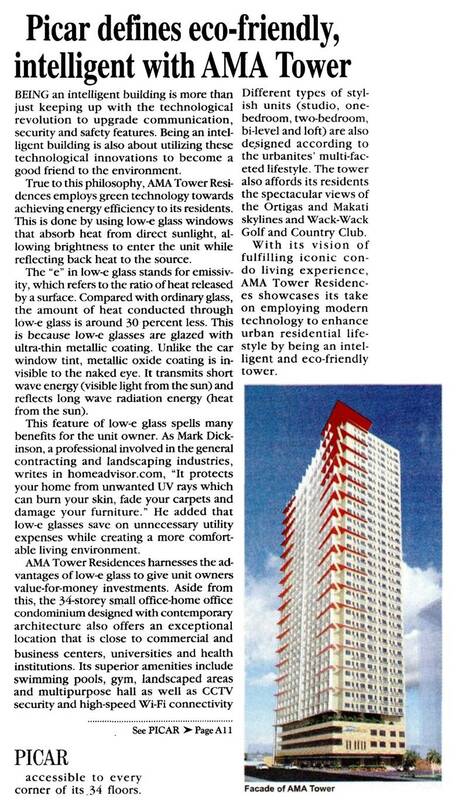 Jim Pedrosa of Jose Aliling and Associates, Rchitects’ principal architect Arch. 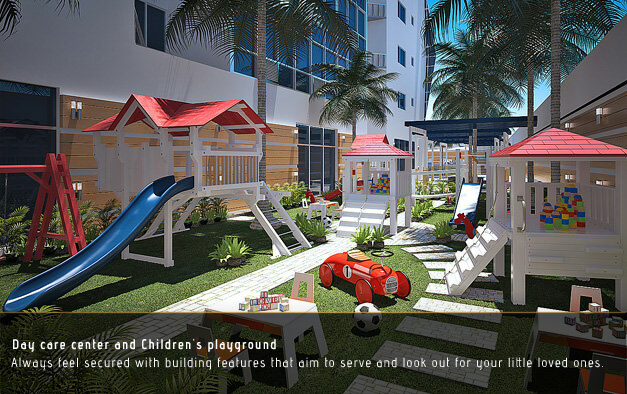 Jose Pedro C. Recio, project manager Arch. 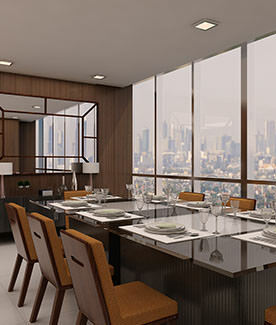 Pompy Agustin and project architect Arch. Anthony Santos, Picar’s assistant vice presidents, and Father Winston Margate who also performed the blessing. 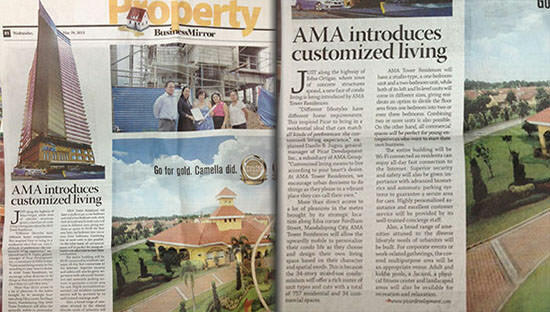 The market’s high living standards are tightening the competition further in the arena of real estate. 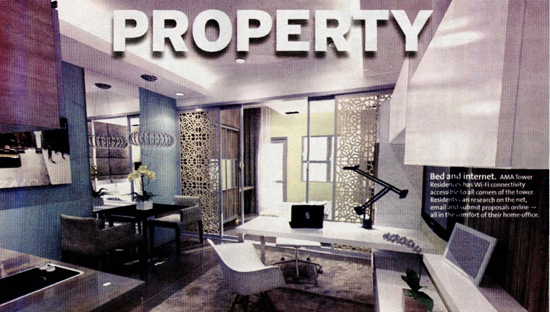 Aware of this reality, Picar Development, Inc., a subsidiary of AMA Group, maintains its competitive edge amid the booming local property sector with innovation. 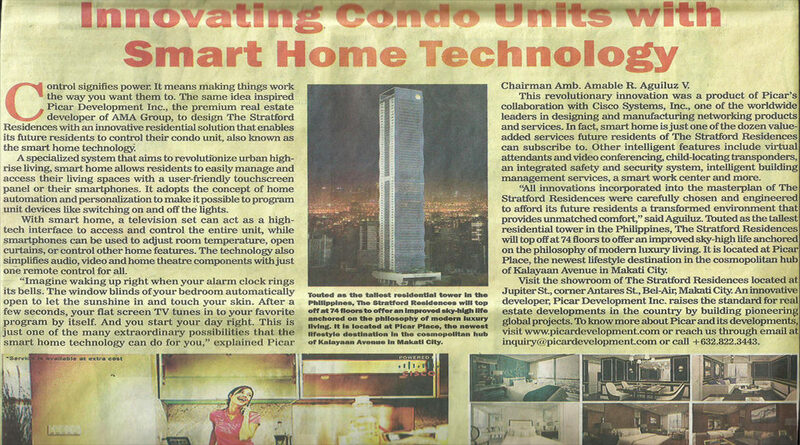 “To innovate means to introduce fresh residential ideas that are forward-looking and revolutionary. 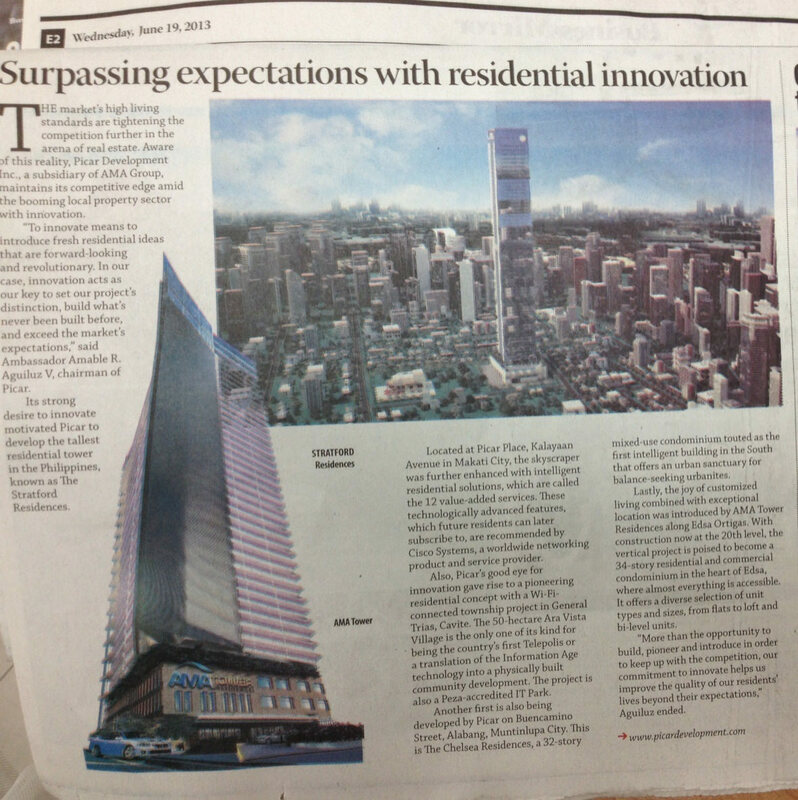 In our case, innovation acts as our key to set our project’s distinction, build what’s never been built before, and exceed the market’s expectations,” said Amb. Amable R. Aguiluz V, chairman of Picar. 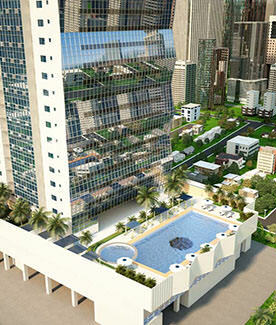 World-class is an international standard of excellence of the highest degree. 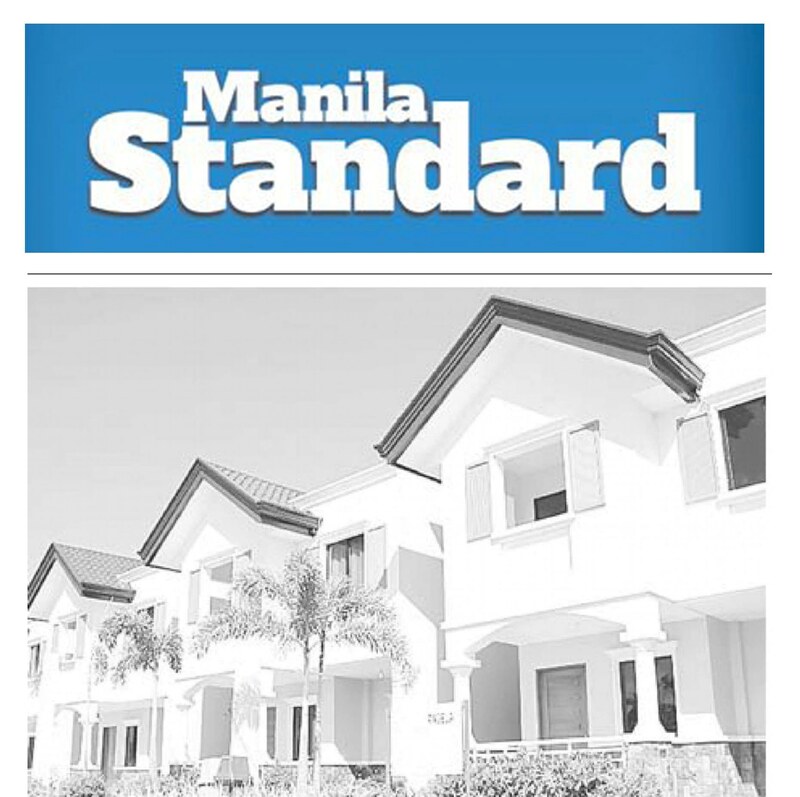 Not all real estate developments in the Philippines can be identified as such, only a few have actually strived to achieve the quality worthy of its definition. 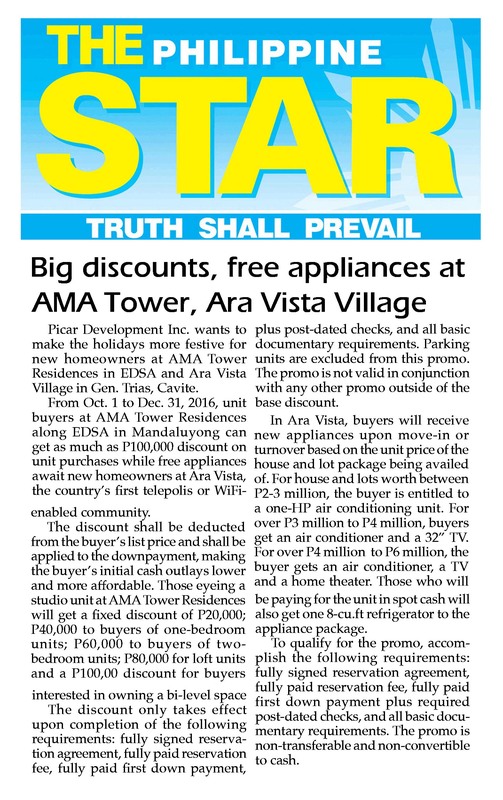 Picar Development, Inc. was established to serve as the premium residential and commercial developer of the country's leading Information Technology Educational Institution, the AMA Group of Companies. 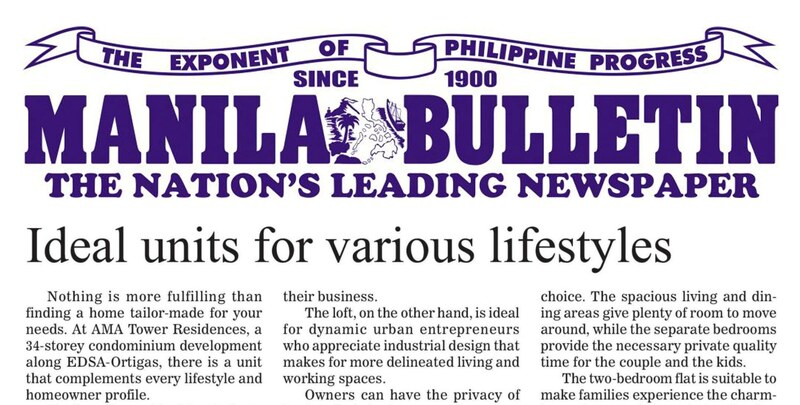 Picar Development Inc.'s commitment is to provide globally benchmarked real estate developments that are focused towards significantly enhancing the Filipinos' standard of living. Control signifies power. It means making things work the way you want them to. 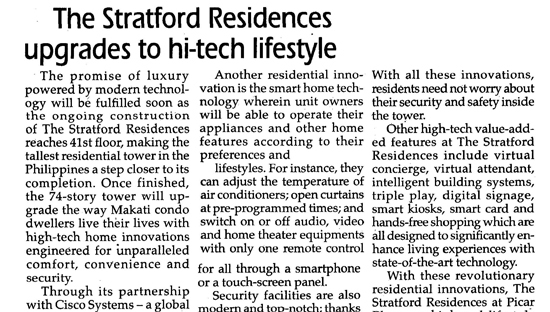 The same idea inspired Picar Development Inc., the premium real estate developer of AMA Group, to design The Stratford Residences with an innovative residential solution that enables its future residents to control their condo unit, also known as the smart home technology. 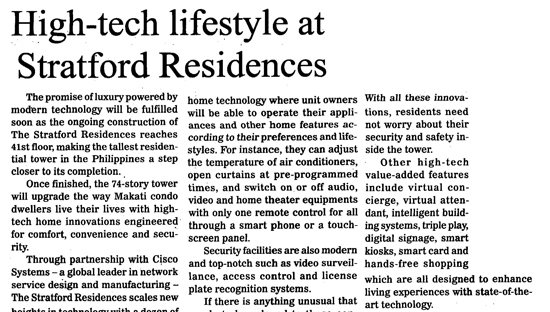 A specialized system that aims to revolutionize urban high-rise living, smart home allows residents to easily manage and access their living spaces with a user-friendly touchscreen panel or their smartphones. 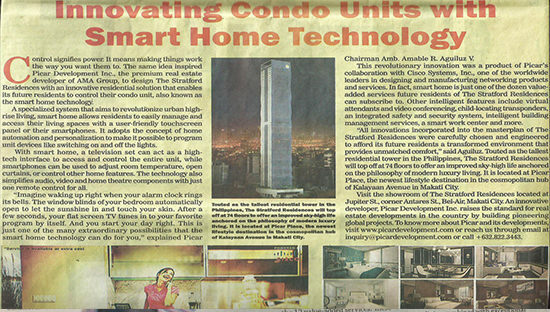 It adopts the concept of home automation and personalization to make it possible to program unit devices like switching on and off the lights. 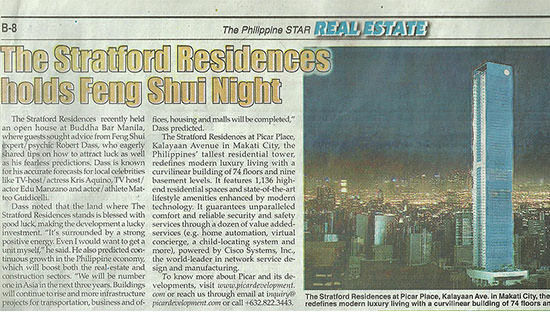 The Stratford Residences held an open house at Buddha Bar Manila, where guests sought advice from Feng Shui expert/psychic Robert Dass, who eagerly shared tips on how to attract luck as well as his fearless predictions. Dass is known for his accurate forecasts for local celebrities like TV-host/actress Kris Aquino, TV host/actor Edu Manzano and actor/athlete Matteo Guidicelli. 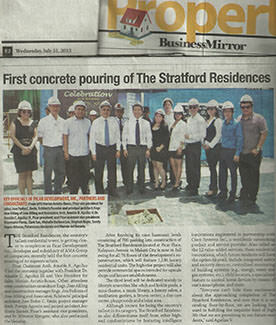 According to Dass, the land where The Stratford Residences stands is blessed with good luck, making the development a lucky investment. “It’s surrounded by a strong positive energy. 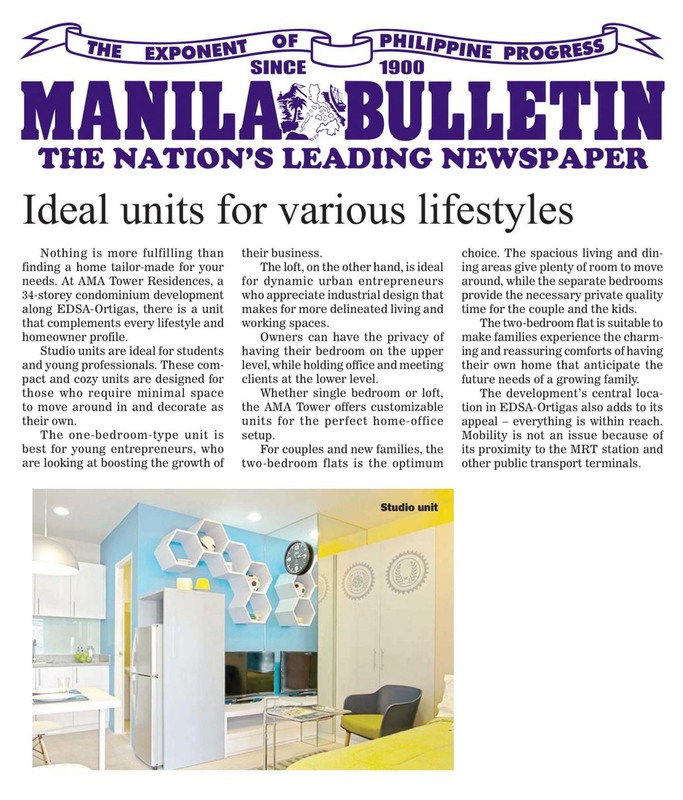 Even I would want to get a unit myself,” he said. 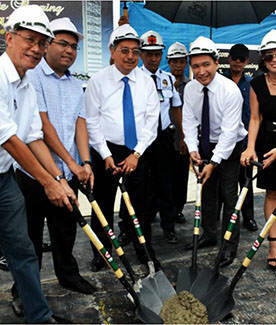 He also predicted continuous growth in the Philippine economy, which will boost both the real estate and construction sectors. 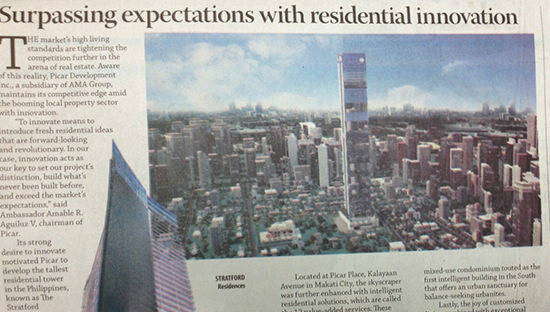 “We will be number one in Asia in the next three years.